Divrigi Great Mosque and Hospital are an ornately decorated mosque and a medical complex recognized for their exquisite carvings and architecture. In 1228-29, while Divrigi was under the rule of the Bey of Mengücek Emir Ahmed Shah, he commissioned the mosque which stands fully intact. The adjoining Hospital was built simultaneously with the mosque by Turan Melek Sultan. The geometrical and floral patterned reliefs found on the main door in particular attract great interest. The architect probably was inspired by Armenian and Georgian constructions. Divrigi is about 600 kilometers from Ankara, so it takes a little while to get there by car. I'm sure you can get there by bus, but it would be quite a long haul. The town of Divrigi is a small village perched on a hillside and the fall was the perfect time to go. I will say the signage to teh Mosque and hospital complex was a little lacking, but it is a small town, so we did find it. Using the word "complex", I expected a larger area then the one building that housed both of the facilities. The outside of the building is pretty non-descript until you get up close to the doors. There were so many carvings and it was so intricately done. They were gorgeous! The first part is the mental hospital, and going inside there are carved columns and a few tombs. Next door was the mosque and it is very much in use today, so it's best to stay away during prayer times. There was no cost to enter this site, but there was a small tea kiosk inside the walls. We felt obligated to buy a cup of tea and watch the visitors that came. There was only one other foreigner there, a European. I wouldn't say this was one of the most interesting World Heritage Sites in Turkey, but I probably would not have made the effort to go otherwise, and honestly that would have been dissappointing, because I had not seen any other mosques decorated in that fashion. If you have some time to kill, and especially if you don't mind renting a car and driving, I would try to do this site. To see some photos and read more about Turkey, please visit my website at http://rovingvails.com/blog/2011/11/07/hdr-divrigi/ . I've been there in August 2008. A place really worth to visit (although finding accomodation in the town is somehow difficult) hosting valuable historical remains but also home to a beautiful natural landscape. I traveled there from Sivas by the morning train along a breathtaking river valley and I came back the same day by the local minibus in the late afternoon. The six hours that we spent there were quite enough to visit the Great Mosque & Hospital Complex (UNESCO World Heritage), to climb to the Kale (Citadel) Hill, to walk through the picturesque narrow streets of the city centre and to have a brief lunch but were insufficient to visit all the historical monuments (mosques, tombes, old houses) spread all around. I would reccomend a 1-2 full days visit. hi everybody, first i want to thanks pople that have very nce comments about our beatiful town. I grew IN Divrigi which has very nice history and people. I reccomend everybody to visit this gorcious town without any doubt. Even people can't find hotel to stay, Divrigi's people will be velcome to tourists to stay at their houses. Hello every one.I would like mentioned that all Divrigi region despite being biggest contributor of Turkish economy with their iron mines. Divrigi region never receive any government funds due to it's non corrupt and democratic Alevi population. Conclusion this part of the Turkey pack with one of kindest people.So I'am urging everybody to go and feel all the beautiful spirits of the Divirigi and Odur Castle. Hi everybody. I am from Divrigi in Turkey. Above text is very nice. Now, your listen a little bit to me. The history of the town dates back to the Hittites (BC 90). Having been called as Teprice-Tefrike in Roman Period, this town was also named 'Divrik' in Ibni Bibi's Seljukname and in some other works and inscriptions in 13 th century. As it is today, the name of the town was 'Divrigi' in Evliya Çelebi's travel book. Really, Great Mosque(Ulu Cami)is very very great. The ruler Suleyman Sahoglu Ahmet Sah of the Mengucek tribe built the Great Mosque in 1228. Entrance, having 1280 sq. meterscentral countryard, is through the three soberbly decorated stone work gates on the west, north, and south. The Medical Center was built by Berham Sah's daughter Melike Turan Melek in 1228. This unique monument is 768 sq. meters. As it was transformed into a Medresseh, it was also called Sifaiye Medresseh. The construction of building lasted quite long. The minbar of the mosque, which is the best example of Seljukian timber work, was made by Tiflisian ibrahim's son Ahmet in 1240. Under the control of Unesco's protection work, there are 440 natural and cultural riches in the list of "World Cultural Heritage" . Nine cultural and natural riches have been included in this list. 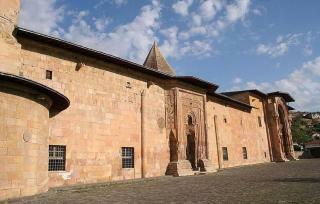 One of the first three riches in Turkey is The Great Mosque of Divrigi and Medical Center. Divrigi Castle was built by Mengucekogullari and today it's a unique Turkish Castle. Its rampart length is 1.5 kms. Most of it was built by Mengucekogullari in 13 th century. Traces of a mosque, a cistern, a granery, and some rock hollows can still be found. Apart from this castle, there are Kesdogan Castle and Odur (Kayabumu) Castle as well. Kale (Castle) Mosque was built by Sahin Sah, the son of Emir Ishak's son Suleyman Shah in 1180. It is very important because of its being one of the oldest buildings. Furthermore, the other historical buildings are as follows; Abi Cimen Mosque (1840), Gokce Mosque (1844), Zeliha Hatun Mosque (1869), Haci Osman Masjit, Kemankes Mosque, Semsi Bezirgan Mosque, Kurtul Ahmet Pasa Masjid, Suleyman Aga Masjid and Turabi Masjit. I spent a day in Divrigi in May 2003 whilst making a trip from the west to east of Turkey. This place is a marvel and it is a shame that so few tourists come here. Of course the most famous attraction here is the Grand Mosque, but there are quite a few other archtectural remains from pre-Ottoman Turkish times: the ruined castle and the burial chambers (turbe) that bear testament to times when Divrigi was a major settlement. It was prized for its iron ore, which is still the major form of economic activity here today. However, for me as a fan of the genre the old Ottoman town houses were probably the greatest delight. These wonderful half-wood half-brick constructions have almost completely dissapeared from the urban regions of Turkey, their places taken by soulless apartment blocks. For me, Divrigi above all is a living museum of Ottoman architecture. I don't recall seeing a single ugly apartment block. You can roam for hours here through an unspoilt sea of twisting little lanes flanked by traditional Turkish town houses, and a lot of them have been kept in quite good condition. Then there is the natural beauty of the place. A fast flowing river passes just by the town, the railway follows this course. This river has cut a steep ravine in the mountains. Take the path up to the castle from the road leading from the town centre to the railway station and continue round from the castle for a really spectacular view of this ravine. (I don't mean the approach to the castle from the Grand Mosque - you can't get round to the side with the view from here!) On the way back down double back along the path taking you past some commercial-looking buildings and you are right beside the river. We are really talking far from the madding crowd. For the most part the landscape in this part of the province of Sivas consists of gentle, green pastureland with higher land in the background. It really is a good place to come for some peaceful inner contemplation. In a word I was totally enraptured by the place. As a postscript, I should add that I am a fluent Turkish speaker and you may seriously have problems locating anyone who can speak a foreign language here. The local people are very genuine and friendly however, although you should realise that this region of Turkey is noted for being fairly fundamentalist, and visitors should make some effort to avoid behaviour that may upset devout Muslims. On the other hand a lot of people in this area belong to the liberal Alawite sect which is characterised by tolerance and open mindedness. There has been intersectarian strife in the region in the past between Alawites and mainstream Sunnis, so I would certainly advise steering clear of this topic. I stayed at the Belediye Hotel near the station. A single room with en-suite shower costs in the region of 4-5 USD per night. It is basic but very clean and well run. It was one of the most beautiful things I've seen in my life, so alluring and ritualistic.. Mathematical Concepts: Projective Geometry. At different hours of a day, 4 silhouettes appear on exterior walls (a man looking straight, man reading a book, a man praying, a woman praying). "These remarkable features could not have been designed without the combination of mathematics, astronomy and art... before the construction of the mosque had started, the scientists observed the positions of the sun and stars for two years. After very careful calculations had been done, the results were applied in the construction of the walls and the carving of the outside doors." 29 Community Members have visited.